Three weeks ago I showed you my first bee block. By now I have finished the second block as well as one extra block and they have hopefully arrived safely at the queen bee. Is your place as messy afterwards? Whilst working on a project my sewing room can get quite messy. But I have to clean it shortly after, otherwise my head will not get cleared for the next project. How are you cleaning up? Directly, after a finished project or step, x times a year…? 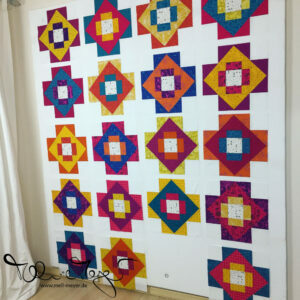 Your feather blocks are gorgeous! 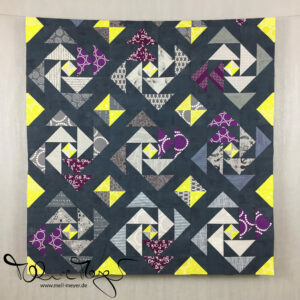 I was looking at this block pattern today, thinking I would like to try it. 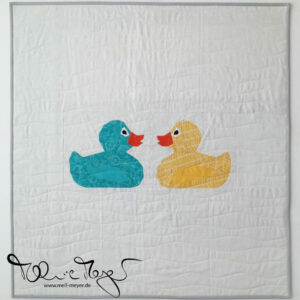 These look great – it’s fun to see each person’s interpretation of the same block. Yup, those are „Mell colors“… I’ve got my palette too!